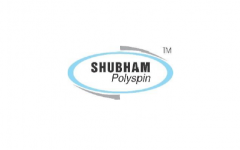 Shubham Polyspin IPO Description - Shubham Polyspin is into the production of polypropylene multifilament yarn. In 2013, the company installed Spin Draw Wind Line Machinery from Lohia Corp having monthly capacity of 50 MT. Spin-Draw-Wind Lines for polypropylene multifilament yarn offer compact and flexible solutions for varied applications. The company had taken premises admeasuring approx 4800 Square feet area at Block no. 95/3, Shed No. C2 & C3, Trimul Industrial Estate, Vadsar Village, Gandhinagar, on rental basis. Following strong demand of its products in the market, the company added one more plant in the month of May 2014 of similar capacity of 50 MT/ per month thus aggregating to 100 MT/ per month. Backed with increased production capacity and an experienced marketing team, the company expanded its sales to nearby states like Rajasthan, Madhya Pradesh & Maharashtra and also ventured in Export Markets. In May 2015, the company acquired land for an integrated production facility at Village Borisana (Taluka-Kadi) admeasuring area of 5009 sq. mtrs. The land purchased was later developed by constructing a Factory Shed admeasuring approximated 2800.00 sq.mtrs. along with Staff Quarters and Administrative Building. The company further added two more Spin Draw Line Machines from Lohia Corp Ltd, hence increasing the total capacity of the company to 200 MT per month. Old plants from rented premises were shifted to the new production site and all the 4 plants were fully operational by August 2016. Shubham Polyspin IPO allotment status is now available on Link Intime's website. Click on this link to get allotment status.